At almost 5 months old (on the 14th! Can you believe it???) Sam is really becoming active. When she's on the ground, she rolls around and reaches for toys. 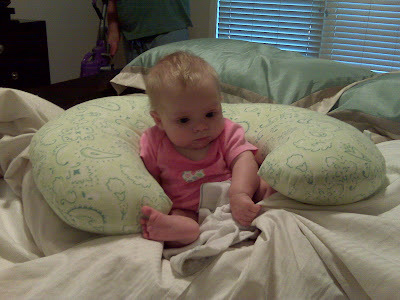 She is pretty close to sitting on her own too - tonight she was on our bed and I moved the pillow (below) and she sat alone for about 15 seconds! I'm crossing my fingers she will fast-track it and sit alone by Saturday for family pictures. A girl can dream can't she?? As I said above, she's into grabbing everything now... toes, hair, toys, whatever. And it can be tiring I guess. 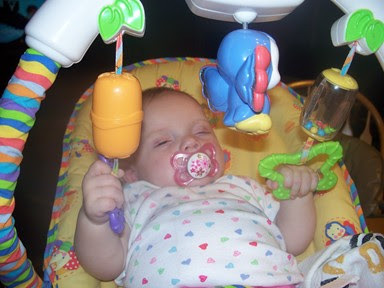 The other night she fell asleep playing in her bouncy seat. Too cute.